Just like any other establishments you might want to visit, there is definitely a huge range of quality within the many coffee shops in Amsterdam. This article dissects the reasons behind my top three, including a brief Pros and Cons list for the skim-reader. Happy smoking! Barney's coffee shop is one of three Barney's establishments. All situated on the same stretch of the Haarlemmerstraat, this close-knit selection of businesses covers all bases; Barney's Farm (across the street from Uptown) is the place to go if you wish to buy weed and Barney's Lounge and Coffee bar is where you can go to smoke your weed (you cannot buy weed in there, though), but Barney's Uptown is king. 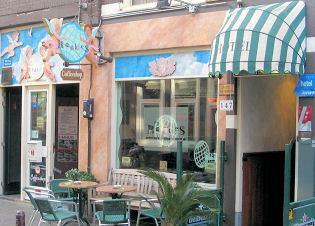 It offers a gentle, relaxed atmosphere where you can smoke and order a full meal and also have a beer. However, you cannot buy weed in there, either. 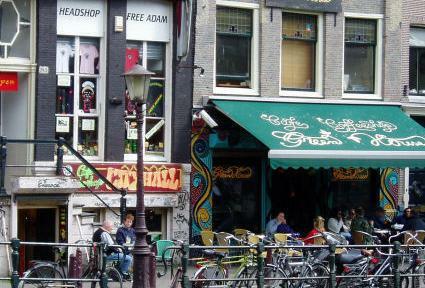 To cut a long joint short, the smoking/buying laws in Amsterdam are somewhat hazy, and the establishments that sell weed need to have a specific license. However, any coffee shop that has a license to sell cannabis is not permitted to sell alcohol. By allowing you to smoke but not purchase, Barney's Uptown has loopholed the laws rather nicely. Add in the next dimension - that Barney's Uptown is one of the few coffee shops that has realised it might be a good idea to offer more than just coffee biscuits to a bunch of munchy stoners - and you've got yourself a beer-and-joint-for-breakfast-with-your-actual-breakfast gold mine. Pros: Beautifully modern interior and one of only a handful of places you can drink, smoke, and have a full meal all under the same roof. Others along the same street are trying to follow suit, but with Barney's sheer size and style there's no chance it will be beaten. Cons: The rules and regulations about where to buy, where to smoke and where to drink can get a little confusing - especially if you're high! But realistically it's hardly even a downside; the three establishments are so close together, its not far to retrace your steps if you forgot to stock up. The one downside is staff can be a little bit rushy, and tend to try and hurry you out the door if you look like you may be finished. This can surely only be a result of it being so popular with the tourists, and besides, out of rush hour the staff are as relaxed as can be. Time your visit nicely and it shouldn't be a problem. 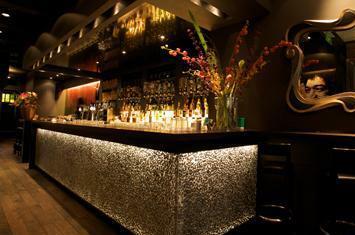 The Swanky (alcohol serving!) Bar in Barney's Uptown. Situated on the next street over from the popular student hostel Hans Brinker Budget Hotel, The Rookies coffee shop for some (probably smoking related) reason always seems to evade the memory in terms of its location. Despite being sign posted relatively well, some how this little gem is always really easy to miss. Split into two sections (a tobacco and non-tobacco side; again, to do with slightly hazy laws about smoking in Dam) this lovely place is a fantastic cosy little number with heavy dark wood furniture and a huge array of cold and hot beverages. They have also made a conscious effort to make the place look a little interesting (which some coffee shops don't seem to attach any importance to) with knick-knacks, signs and colour fade lighting. The staff members here are always extremely friendly and are more than happy to share their knowledge of the local area, even suggesting some alternative coffee shops to their own. The Rookies hash brownies are also extremely tasty, extremely potent and at 4€, fantastically priced. I would definitely recommend a giant, gorgeous iced coffee and a hash cake from The Rookies to start your day if you want to be high, but also want to get out and about. Pros: Cheap hash cake, really nice staff who are willing to share their knowledge of both cannabis and the area, and a huge drinks selection. Cons: Seeing as they have made a clear attempt to follow the tobacco ban, it's a little tricky to roll a joint in here with tobacco. Although the staff are aware it still goes on, it is not something they wish to have branded about the place. To avoid any discomfort, decant your tobacco into a tin before hand, to be a little less conspicuous. Also, The Rookies can be a little too dimly lit for a mid-afternoon excursion, so be wary not to doze away your trip in here. Another one of a chain, Greenhouse Centrum is the smallest and kitschiest of the three. Covered in lovely, detailed mosaics and with a rockery/fountain thing in the corner, this one is a real winner for interior interest. With a nice choice between a snug bench covered in cushions in the back or more café type tables in the front window, The Greenhouse Effect seems equally suited to all year round visits. The staff members are totally laid back and seem to genuinely regard you as a person rather than another obnoxious tourist, which can often be the case in some more mainstream coffee shops. During our stay there, and after a long, pleasant chat with the lady behind the bar, this was proven to us. Having explained we visited Amsterdam exactly a year previously, and that our sentimental Greenhouse lighter had still not run out, she laughed, disappeared, and returned with another, free of charge (normally 1.50€). Sounds inconsequential, but it made a difference. It's no wonder that The Greenhouse staff members are very friendly though - they have won multiple Cannabis Cup awards in the past – and you can see why. Everything is neat, tidy, and the staff are extremely efficient. A little stand on the counter provides you with as many free papers and roaches as you need, and the weed is of excellent quality. Staff are happy to recommend appropriately to what you are after (happy high, chilled high, whatever) and all within that lovely setting. Top notch. Pros: Great staff members, neat, tidy and an awe to look at. They are also totally cool with you playing your chess/cards/Bananagrams in here. Cons; This is one of quite a few coffee shops that has a locked toilet. This system is often in place to deter hard drug users from using the establishment to take illegal substances. Although this is an understandable and noble reason for doing so, it doesn't make it any less irritating that you have to (sometimes) queue to get a key from the bar staff after 36 large cappuccinos.